Being in a car accident can be stressful and expensive - or it can not. A smooth, reassuring and proficient auto collision repair process can take the stress away. So what should you expect from a process like that? Comprehensive assistance is a must. Your vehicle repairs shop should be by your side every step of the way, assisting with tow services, rental car, insurance liaising and more. You should also expect thorough damage inspection, which sometimes may include vehicle disassembly, to make sure there's no hidden damage before the insurance claim is filed. Of course, never expect anything less than expert structural and body repairs finalized by quality control inspections. During the entire process, which can sometimes be lengthy, you should be able to count on regular updates as well. Here at CARSTAR Auto Body Services in Irvine, CA, we strive to do just that - be by you and your car's side every step of the way. Car trouble is always painful, even more so when you're involved in an accident. Calling the guilty party's insurance company, filing a claim, getting referred to a repairs center, making an appointment, calling rental companies, etc. - it can all be daunting and frustrating. Here at CARSTAR #15366 in Irvine, CA, we like to make it easy for our customers. We take a comprehensive approach to auto collision repair through four simple steps: Assist, Assess, Repair and Deliver. We'll take care of tow services for you, and we'll liaise with the insurance company to get you in a rental car as quickly and as smoothly as possible. We'll run an extensive damage assessment and even disassemble the vehicle to look for hidden damage, followed by a detailed repair plan for you to review and approve. Our expert technicians will start working to fix any structural and body damage, paint and refinish your car and finish their work with quality control inspections. Last but not least, we'll complete post repair wash and full clean up, to deliver the car to you in top shape. We will also take care of all paperwork and national warranty. Often times, insurance companies will recommend an auto body shop for repairs after an accident or will very swiftly send you to one. But it's important to know that you have the power of decision and you should certainly look into finding the best auto collision repair center for you. There are many options out there, so be sure to research thoroughly, as this goes beyond a couple of reviews and convenience of location. Make sure you choose a center that specializes in collision repairs, is established with experienced and skillful technicians, but also has state-of-the-art equipment. You'll find all that and more at CARSTAR #15366 in Irvine, CA, including excellent customer service and assistance throughout the process. At CARSTAR, you'll find more than auto collision repair services. We take the same comprehensive approach even if your vehicle has not been involved in an accident. If all your car suffered from are minor dents and dings, we provide Paintless Dent Repairs, a great way to freshen up the look of your vehicle without a major investment. We also offer Fleet Services that handle any size or type of fleet while keeping your costs low. 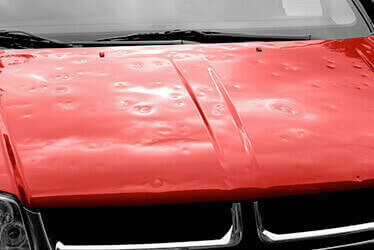 When nasty storms strike, you'll find Hail Damage Repairs at CARSTAR #15366 in Irvine, CA as well, so you can get back on the road as soon as possible. Contact us today to learn more about the range of services offered near you.